Note: This blog is in two parts – the first about Moodle and Language teaching, the second only about Language teaching. So read one, both or neither, depending on your interests! While British, Russian and American politicians engage in serious handbag flailing, ordinary people in each country are getting on with each other and with their lives. 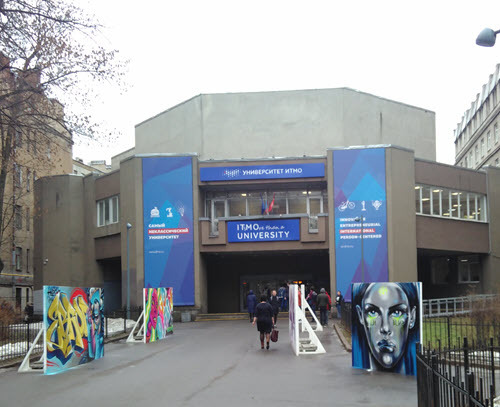 Thus it was that I arrived in St Petersburg last week to attend a conference on English for Specific Purposes at the prestigious ITMO university. Several of the English faculty completed our Learn Moodle Basics MOOC in January (Quick plug: sign up now for the June 3.5 MOOC!) 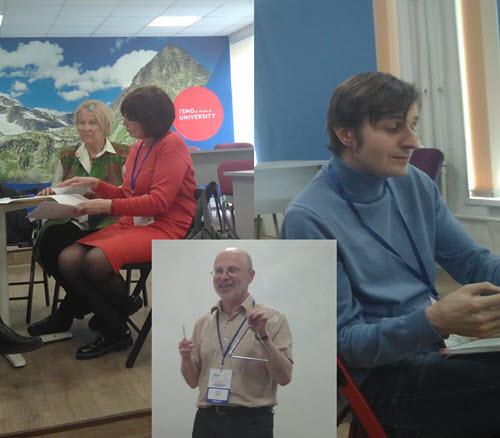 and so I was invited to give an overview of Moodle and its possiblities for teaching English. Apart from a brief time during my student days, I have never actually taught English to non-native speakers, but I have taught foreign languages to native English speakers, and as I discovered, the skills are very transferable. So transferable in fact, that by the second day of the conference I began to think I’d taken the wrong career path thirty years ago – but it’s a bit late now! I started by explaining the background to the Moodle open source software, as the conference participants ranged from those whose universities used it fully to those who’d never heard of it, from those who used it on their own within a higher education establishment to primary and secondary school teachers who saw its potential for their classes. This is where Moodle has real value: with technical knowledge you can install it and maintain it yourself, for free; as an individual teacher you can use MoodleCloud offerings where the hard work is done for you, or if you have money and specific needs you can engage a Moodle Partner. See all three options here. I then went on to highlight the benefits of Moodle when teaching languages, be that ESP, as at the conference, or other Modern Foreign Languages, as in my own experience. For ease of explanation, I divided it up into four areas, and below is a summary. I chose to talk only of standard or free plugins, although I do know there are some very good paid options for language teaching with Moodle as well. As with your documents, easily drag and drop your own sound and video files, and remember too that Pages and Books display external media such as YouTube videos very well…. Use the popular, free and trustworthy RecordRTC plugin to record extracts of poems which students must respond to in quizzes: UPDATE: This plugin is now standard in Moodle 3.5 in the Atto editor! and if you want to set a speaking homework, RecordRTC’s video option allows your learners to make a mini-presentation as an assignment. (I did a demo of this too but I’m not going to display myself here!) UPDATE: This plugin is now standard in Moodle 3.5 in the Atto editor! For non-graded or collaborative writing, Moodle’s wiki activity serves you well. Or why not embed a Google doc (or Microsoft equivalent)? For graded written tasks Moodle’s Assignment activity offers a rich variety of features – too many for the time I had. Did you know you can set a word limit, allow groups to submit, annotate and comment directly on submissions, use percentages, letter grades or any complex rubric you choose? This entry was posted in Moodle on April 8, 2018 by admin.